The purple did the trick…set the scene so perfect. Loved the way you narrated.For sure there is spring and flowers to relish and relax.Nice take. This piece was so poetic. The sylvan scene, the emotion were beautifully expressed. You weaved a rich tapestry building up to the kiss. Nicely done. 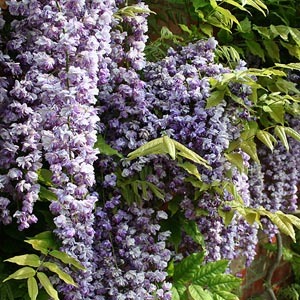 Just simply wonderful – I could smell the wisteria and felt the anticipation – well done! Ah lovely. I’m really enjoying all these first kiss stories… So much promise of things to come! There would be more winters and sadness would come as it comes to all of us. This whole piece was lovely, Dee. Gotta love the wisteria chapel. The wisteria chapel is a real place. Up the road from my on-laws home on the road named for Dorcheat Bayou, there is what must be an old home place. The “home” is gone but the wisteria that may have been carefully pruned at one time, had it’s way with the trees and bushes and anything else that stood still long enough to be frosted with a lavender covering. I never actually walked through it because I suspect there was poison ivy under the pretty and it looked a bit snaky as well but it was more beautiful to me than most planned gardens. Mother nature is queen. Oh, Dee, the scent of wisteria hung heavy over this one, and for a moment I thought the butterflies in the header were the tiger lilies in Nuala’s hair. I think we need the beauty of warm spring days such as this one to carry us through the sadness and cold of winter. Just wonderful. What a beautiful piece of writing. I loved it. The scenery may be purple, but the prose isn’t, and for that I’m thankful! A lovely passage, evoking all the simple and complex feelings of being in love. You touch very cleverly on the sadness of love, too, without weighing down the feeling of the story. Kudos! Fragrant and sweet… just like that first kiss. Completely lovely. thank you everyone. I enjoyed writing this and remembering the “wisteria chapel”. I read this again tonight and see some things that need to be pruned. I get too wordy.